The iconic camera company that launched the point-and-shoot is now putting the “you push the button, we do the rest” philosophy into commercial photography. 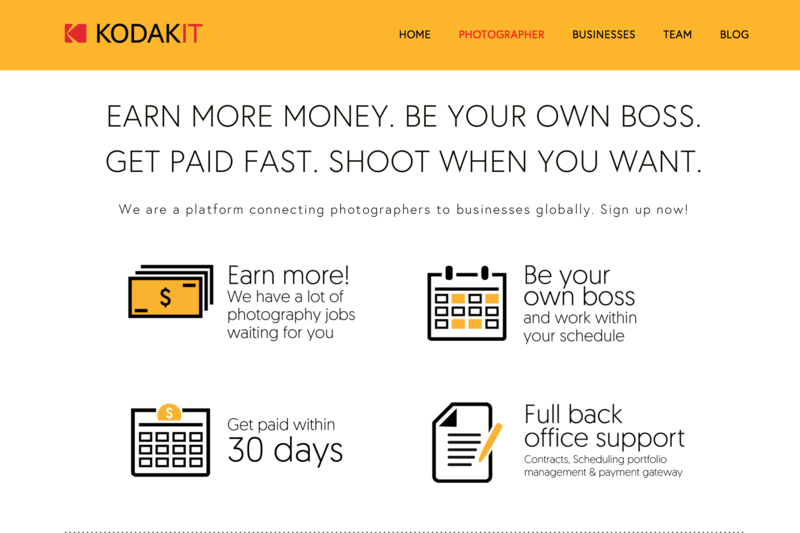 Kodakit is a new on-demand photography platform that streamlines the marketing and booking process for photographers and eliminates the complex hiring process for businesses. Kodakit is similar to other online workplaces such as Upwork, with a key difference — once a company posts a job with the when and where, the Kodakit platform finds a pre-screened local photographer and even delivers the final images on a private cloud system after the shoot. For photographers that pass Kodak’s screening, the platform could mean less time spent on marketing and booking. Kodakit takes care of the invoicing and payments, too, with the gig being paid for within 30 days. According to the Kodakit user guidelines, photographers can set their charges for each particular gig. The business client does receive full copyright ownership of the files and photographers are asked to follow the system’s turnaround times — two days for shoots that are less than two hours long to two weeks for shoots that are longer than four hours. Launching this month, the new service is now live in 92 major cities in 37 countries, including New York, San Francisco, Paris, London, Hong Kong, Singapore, and Delhi.